When you’re watching your waist line an excellent diet to try is the “see food” diet, ha ha! 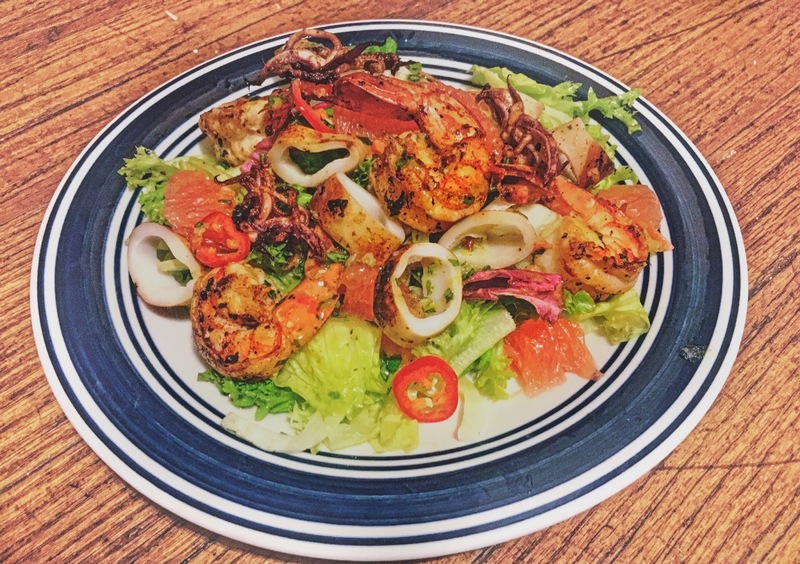 But sea food is awesome for you and very low in calories but for me, seafood salad means fresh crisp greens and grilled seafood, no mayo! The dressing is also absolutely fantastic on the side of simply grilled shrimp for a cocktail party or appetizer as well. Clean the seafood and place in a large bowl, add the juice and zest of one lemon, olive oil, Italian seasoning, salt and pepper and set aside. Combine the olive oil, juices, zests, herbs, garlic, vinegar, red pepper flakes and salt and pepper in a bowl. Take half of the mixture and put it in a blender and blend until smooth, pour back into the bowl, mix and set aside. Heat a grill pan, or grill, and add the shrimp and calamari. Cook the calamari about 3 minutes each side or until they are white and begin to curl. Cook the shrimp about 2-3 minutes per side or until they turn pink and opaque. Allow the calamari to cool a bit and slice into rings. 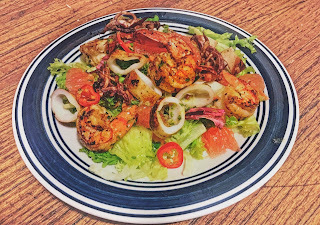 To dress the salad, add 2-3 table spoons of dressing to a large bowl, add some of the shrimp and calamari rings, and about 2 cups of the salad greens, some of the fennel and toss until everything is lightly coated with dressing. Top with grapefruit segments. If you do not care for grapefruit, you can use oranges as well.